If you are looking for a cozy, romantic getaway for two, Robyn's Nest is the place to be. 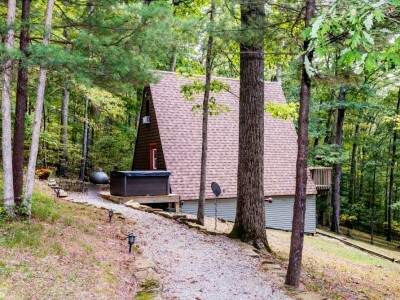 The A-frame chalet sits high up on a hill, secluded and private and the views of the wooded hillside are amazing from the hot tub on the back deck. The main level has a cozy combo kitchen and dining area, perfect for a romantic dinner for two. The bathroom includes a shower. Climb the stairs to the loft bedroom which has a double bed facing a wall of windows. Relax outdoors sitting around the fire pit or watch the stars from the outdoor hot tub. If you want to have friends and family close by, they can stay at Windipine, which is a quarter mile down the road. Close to the Village of Nashville and 4 miles from Brown County State Park.